Homecoming Week rings in a major milestone for Good Hall, a historic campus icon, and an exciting new development for the School of Business as it unveils a new Finance Lab. 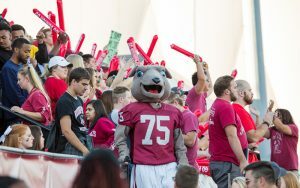 2018 Homecoming also offers more ways to reconnect than ever, with the addition of affinity reunions like the Black Student Association Alumni Tailgate, the 20th anniversary of Lantz Center for Christian Vocations, the Cheerleading Alumni Tailgate and many more. At 1:15 p.m. on Friday, Sept. 28, the new School of Business Finance Lab will be dedicated. 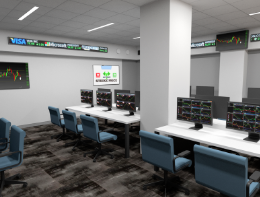 This transformational addition to the School of Business brings students access to state-of-the-art technology that reflects the Wall Street environment. The Finance Lab is an important component of the School of Business’ project-oriented applied curriculum, and offers students training on professional-caliber tools including Bloomberg Market Concepts. “The Finance Lab is another testament to the University’s goal of providing hands-on learning opportunities to prepare students for their careers. 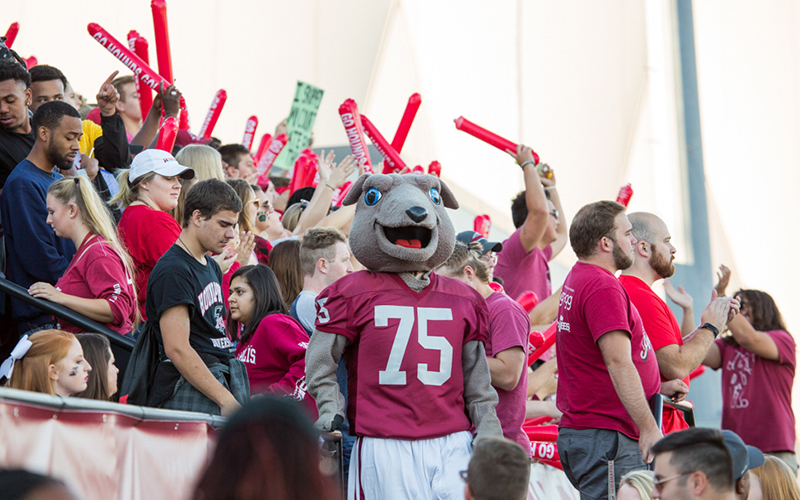 Offering this experience during Homecoming Week allows us to share that moment with alumni, board members, donors and the entire UIndy family,” said Stephanie Hays-Mussoni, associate vice president of development. The exterior restoration of the Good Hall pillars and portico will be showcased during Homecoming events on Saturday, Sept. 29. Inside, guests will be able to see the first floor renovations and the new home of the Shaheen College of Arts & Sciences. Built in 1904, Good Hall was the University’s first and only structure for about 18 years. It was named after the University’s third president, I.J. Good, and was home to the first University president, Rev. John Roberts. Good Hall has served as an administrative and academic building, library and chapel over the years. The structural renovations, which will continue on the second and third floors throughout the academic year, are transforming Good Hall into a learning environment aligned with the needs of today’s students. 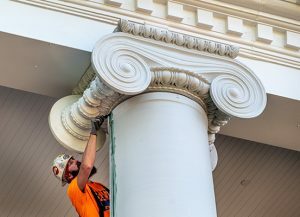 Andrew Kocher, associate vice president of alumni engagement, said the restoration symbolizes the University’s commitment to liberal arts education as it acknowledges the building’s historic role. Both projects are generously funded through the Campaign for the University of Indianapolis, which continues in its second phase to conclude in 2022. The campaign received support from more than 32,500 friends, alumni, faculty, staff, parents and organizations. The fun starts Friday, Sept. 28 at the Alumni Welcome Center at the Stierwalt Alumni House. Alumni are encouraged to drop by from 1 p.m. to 4:30 p.m. The Finance Lab dedication takes place at 1:15 p.m. at Esch Hall. on Friday. At 4:30 p.m., the 50-year Club Reception will be held in the Trustees Dining Room for alumni who graduated in 1968 or earlier. Starting at 5:30 p.m., alumni, friends, students, faculty and staff will celebrate remarkable alumni at the Alumni Honors & Recognition Dinner. At 8 p.m., alumni baseball players and friends will honor Coach Gary Vaught with a roast ceremony on the fourth floor of the Health Pavilion. Game Day is Saturday, Sept. 29. Start the day bright and early at 7:30 a.m. with the Hound Hustle 5K Run/Walk starting at the Schwitzer Student Center. At 9 a.m., the UIndy Men’s Basketball Program hosts a golf outing at the Sarah Shank Golf Course. At 10:30 a.m., the Class of 1968 holds a reunion gathering at the Stierwalt Alumni House. Historical facts from 1968 will be highlighted and the class will share memories from their time on campus. At noon, get campus updates from President Rob Manuel and visit the newly restored Good Hall for the Founders Day lunch and celebration. You’ll also get the chance to view historic campus maps designed by UIndy faculty and students. Good Hall rededication takes place at 1:00 p.m. At 2 p.m., head over to the Stierwalt Alumni House for a Campus Heritage Tour. At 3:00 p.m., hear the musical talents of UIndy alumni at the Alumni Recital & Reception at the Christel DeHaan Fine Arts Center. Or head over to the Ruth Lilly Center to cheer on the women’s volleyball team as they host the Lewis University Flyers. Tailgate Town begins at 4 p.m. in the Nicoson parking lot with paw-print face painting and inflatable games. The Homecoming Parade takes place from 4 to 5 p.m. through campus and along Hanna Ave. Don’t miss the golf carts! At 6 p.m., UIndy Football hosts Lincoln University of Missouri at Key Stadium. The following groups will be holding special reunions to reminisce and create new memories at Homecoming. For more information contact the Alumni Office at alumni@uindy.edu or 317-788-3295.